When you teach the concept of countability in English, students have to learn to use the words A, SOME, THE, ANY, AN in front of the nouns correctly. To decide correctly, students have to take several mental steps.In this post I explain the mental process and I offer your students a chance to practise it in several games. In this post you will find a simple infographic, which explains the thinking process. Moreover, there are three brand new games in which students can practise the grammar. If the students have already spoken about the thing, then we have to use the article THE. If not, then they have to ask whether the noun is in plural or uncountable. If any of the answers is Yes, then two more questions have to be asked. Is the sentence a request or an affirmative sentence? If the answer is YES, then SOME have to be used. If the answer is NO, then ANY have to be used. 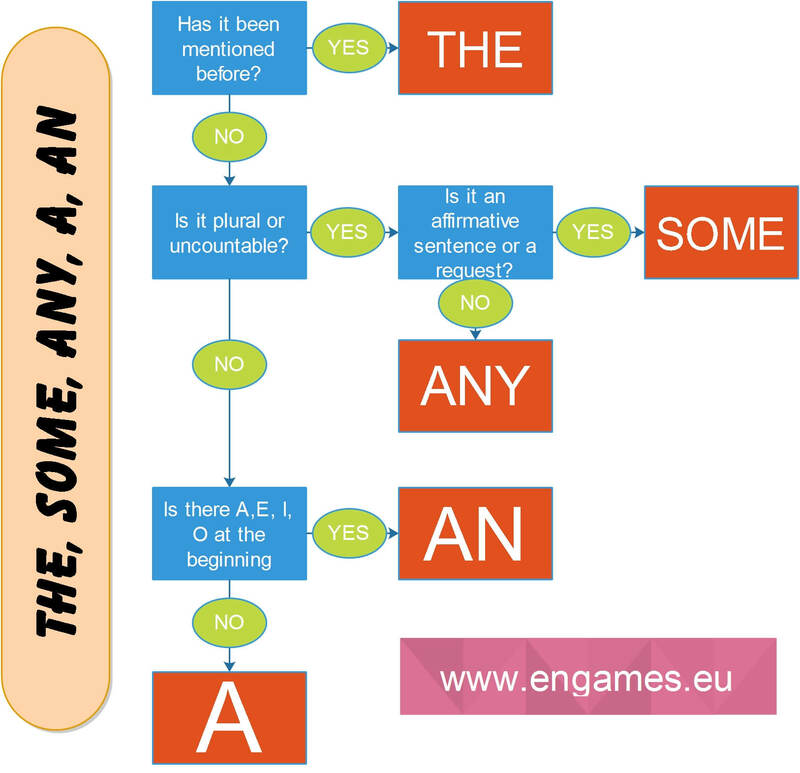 If the noun is not in plural or uncountable, then A or AN is used. AN is used if a vowel is pronounced at the beginning of the noun. Otherwise A is used. The process might seem a bit complicated when you read the text, but my students found it very easy when they could use the infographic. To practise the grammar, I created three brand new games. All the games are in HTML5 and they will play on desktops and mobile devices. The first game is called Shooting Game. Your task is to read the sentence and shoot the correct answer. To shoot the word, just click it. Speed matters and you will see your score at the end of the game. Will you be better than me? The second game is called Dice Game. Your task is to type A, SOME, THE, ANY or AN (do not use the capital letters) and then stop the dice. The more points the dice show the more points you get. Moreover, if both the dice show the same number, you get a bonus – 10 points. The third game is called Time Guess. Your task is to complete the sentence with the correct word and then click the button STOP at the moment you think the countdown got to zero. The closer to zero you get the more points you get. Poll – Which game do you like best? I like this game. I want to play again.Me and mother are playing now. I love you.